Having read the biography of Steve Jobs I basically knew the story and I guess the movie gets it mostly right. 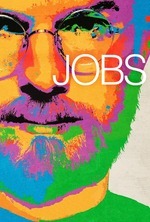 Kutcher plays Jobs very convincing but there are problems. The choice not to look into Jobs‘ early life and not really explaining where he’s coming for example. There is real drama in Jobs‘ life but quite like the Social Network it’s not in the company but in the people. However except for Jobs the movie shows no colourful characters, so it lacks actual confrontational moments or character development or a sense of accomplishment. And then there is the sudden jump between him leaving Apple and coming back years later. So if you want the whole story, you need to read the book. The movie visualizes a slice of it but is not much more than that. So, How’s That Japanese Manga on Steve Jobs?